Sleep mode - Your keyboard will automatically switch off after 3 minutes idle time to lower power consumption, pressing any key will immediately bring it back to life! 7 colour choices - Choose 1 of 7 different colour choices! Giving you more options to pick your favourite colour that matches your personal taste! Underlit key illumination - High quality LED lights provide clear and bright LED lights that looks good at both night and day. Pulsating colour shift mode - Besides picking any of the 7 different colours available you have the option for the keyboard to 'pulsate' between all 7 different colours slowly. Multiple brightness settings - Pick from multiple colour settings to your personal preference. 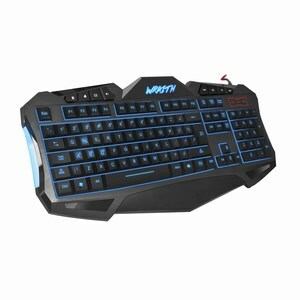 High quality keyboard with multimedia key - High quality keys provide responsive and satisfying feedback during typing and gaming sessions.